Try pushing the straw into the potato slowly - does it work? 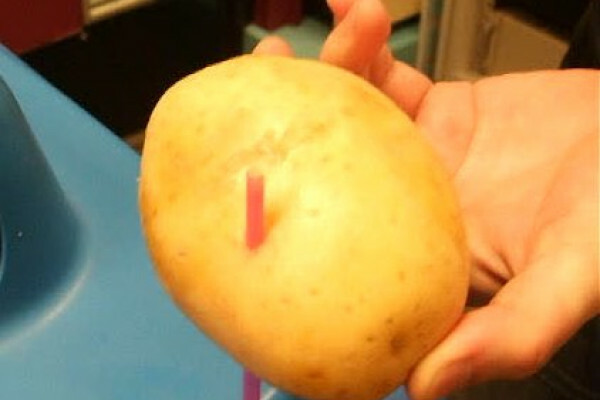 Now hold the straw gently and stab it into the potato as straight and fast as possible. You should find that if you push the straw in slowly it will just bend, but if you stab it quickly it can penetrate up to 50mm into the potato, or even all the way through before the straw collapses. If you look at the end of the straw it is very narrow and actually quite sharp, so if the straw doesn't collapse it will make a good knife. There are two reasons why the straw penetrates better when moving quickly than slowly - the straw is effectively stronger and the potato is easier to cut. The straw is being compressed between your hand and the potato. When you squash a flexible tube it will fail by bending and then buckling. The more it bends the weaker it becomes until eventually it buckles and fails. If the straw is perfectly straight it is very strong If the forces on it are not quite even it can start to bend If it bends too far it buckles and becomes much weaker After it buckles it can bend very easily. If you move very quickly the straw doesn't have time to buckle, this means it maintains its strength throughout the collision and it can penetrate the potato without getting damaged. This failure by buckling is the reason that the parts of structures that are in compression, such as columns have to be much wider than the wire ropes that are used to support similar loads under tension. The columns have to be very stiff to resist the buckling. What about the impact speed? If you use an axe it will cut through wood a lot better if you swing it at a piece of wood than if you just push it slowly the straw is the same. This is for two reasons. If the straw is moving slowly the surface has time to distort and spread out the force where as if you move fast the force is concentrated at the sharp tip of the straw. Also if the straw is moving quickly and hits the potato that resists its progress, for the straw and your hand to stop immediately would require the potato to apply an immense force on the straw. For every force there is an equal and opposite force so the straw must be applying the same force to the potato, which the potato can't stand so it breaks.